Hello all. Long time, no chat, eh? I suppose I could say that the hiatus is officially over. I have returned with a new layout. Much fresher, cleaner, and summery than the last. Have a suggestion for the title? Please let me know for I cannot think of a nice and fitting one myself. I am rather proud of this layout. I picked the image with a designer's mentality, noticing that the basic flowers in the image could be recreated and utilized. 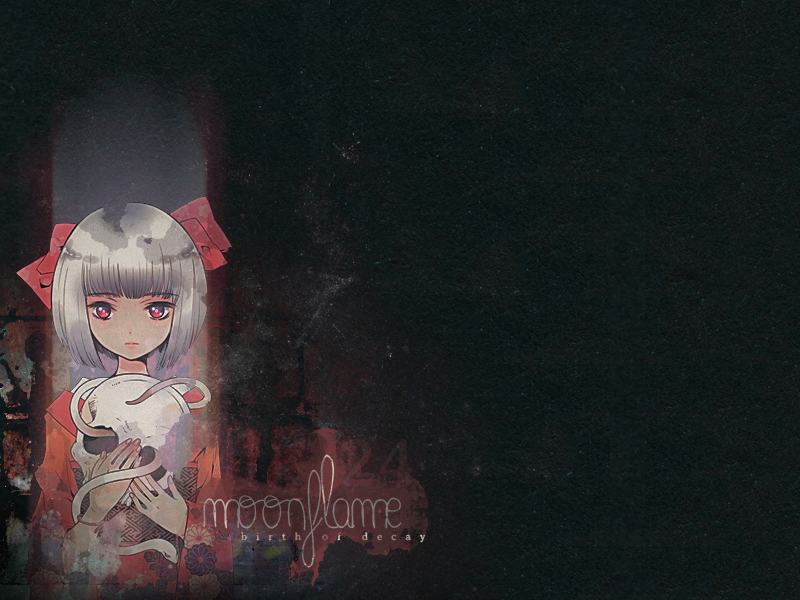 Not to mention the image itself is Chobits; such cute artwork! I would like to thank Tiffany who was a huge inspiration to me while creating this layout. School is finally over and for now, I am out of work. This means that I will have plenty of time to work around the site. I am so glad for this time I finally have. Updates around the site include pruning of the PNGs section (it was lacking and I do not see myself adding to it any time soon) and the Anime Tutorials (I should say tutorial, as there was only one). Also pruned was the two Photoshop tutorials. However, those have been replaced with a Star Field Tutorial and a Light Spiral Tutorial, for your viewing pleasure. In the tutorial department, I have also updated the Basic HTML Tutorial, to cover a wider range of codes. I will be adding two new tutorials in that section at a later date, so stay tuned. Graphical updates include a hiatus sign and a signature. I have no intention of keeping the graphical update this small, so please check back for more later. I really do love my new signature though. Very proud of it. All pages have been recoded to match the current layout. I decided to knock it out in one night so I could not choose to put it off until the next new layout. Please enjoy the new updates and do come back again for more. It is summer time now and I plan to break no promises. To my affiliates, thank you for being patient with me during my hiatus. I am back now and will be around to visit you all shortly. So, in the words of a best friend, Moonflame has been quite like a plane without gas. It just sits here. And, though I do resent this fact, I am unable to find the time of day to update properly. Honestly, whenever I feel as though I'm in a 'graphic-designing-mood,' I'm incapable of finding appropriate pictures to design with. Thus, I lose my initiative as quickly as I had gained it and a strong sense of lethargy kicks in. Now, I would love to kick the sense, and maybe recapture some proper sleeping habits so I could develop the time, however, my lack of willpower somehow destroys the very desire to do any of the aforementioned things. Don't get me wrong. I have absolutely no intention of closing down the site. Three years, not all strong, but heck if I'll deny it. Moonflame is my pride and joy, one thing I refuse to discontinue. Some time is all I ask, though I know the three months that have passed seem like plenty. Some time to get the site back on its feet, with a fresh new layout and more graphics than I have ever provided before (and this includes Neopets graphics, as well). So, although I hate to say it, and I don't hate much, I will be putting Moonflame Designs on an open hiatus. I refuse to close it down and stick a hiatus sign up only because I do have some graphics, and good or bad, someone may wish to use them. I'm sorry for my inactivity and my lack of communication with my affiliates, who continue to update, often or not. I appreciate your tolerance with my absence thus far. However, if you feel as though you no longer wish to keep me as one of your affiliates, I understand completely. This hiatus should last until the end of the school year, maybe even before once my load of work dies down. Thank you for taking the time to read this and for understanding. By the way, you will find a new bookmark and signature are up on the site. They were a few odds and ends I have been working on. I may update with a sign sometime during the week because I do have one waiting to be finished, as well as a layout. As for said layout, you can see it in progress here. If you have any suggestions for font style and placement of navigation, I'm all ears. . or eyes. I can't think of much to finish the layout, so some ideas would be great to hear. Thanks again. Oh, and I guess I updated the Past Layouts section, too. I think the previous three layouts I have had are now added. And, I introduce to you Moonflame's 18th version, Sky's the Limit. Totally not the colours for which I was reaching. Nonetheless, they're pretty congruous and not completely blinding. Still, if the next layout I make isn't dark, well.. I actually don't have a good threat or anything. I just hope the next one is dark. Anyway.. This layout should prove to be a pain in my neck for about another hour or so (mind you, it is now 4:00 AM). I need to go through and switch each table code out with the new one. This process is about as much fun as a box of starving and rabid poodles (translation = it's serious business). But, besides the arduous coding I'll be doing, I rather like the turnout of this layout. I hope you feel the same way. I had originally planned the release of this layout to include some fancy-pants, new graphics, however, I found that the longer I waited to put this layout up, the more I started to dislike it. I would like to have this layout up for at least two weeks before I hate it. Of course, this does mean that there are no new graphics. Except, I do think there is a new hiatus sign. I've been in quite a rut, graphics-wise. But, really--honestly, what else is new? I know I use that excuse all of the time and I'm really sorry for it. But, everything I've made recently just isn't me. I refuse to upload a graphic I dislike. So, hopefully, I can brew up some new graphics and have them uploaded as soon as I finish recoding this baby. Also, I'm sorry about being inactive. School has had me up to my elbows in work. I'm so glad we're starting a new semester. Hopefully, I can make things right this time. For now, enjoy the new layout, and look forward to new graphics. I promise they're coming. VERSION EIGHTEEN FUN FACT: Do you see the tan blob with the mini-paragraph of text atop it in the main image? I had to add those because without them, the blobs of colour below them formed a shape that looked way too much like the silhouette of Lloyd Irving from the game, Tales of Symphonia. At first, I had thought of the small illusion as 'cool,' but it soon began to bug me. I had to do something to patch it up.